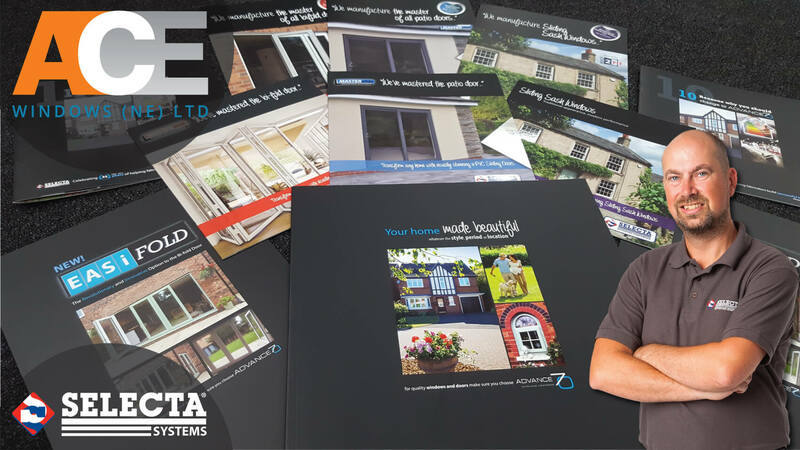 Selecta Systems fabricator Ace Windows (NE) Ltd has been impressed with the quality and look of the new batch of marketing brochures and materials whilst also commending the excellent customer service that they regularly receive from the team. Feedback from Selecta Systems customer base has been exceptional following the launch of a series of new marketing brochures and literature. Selecta Systems Marketing Manager, Mark Walker, sheds light on why he feels the new marketing materials have been so fondly received and how they seem to have hit the mark with customers. “Firstly, I felt it was important that they had continuity and consistency with a colour scheme and theme that performed across the whole range, thus instantaneously recognisable as part of the brochure range. Instead of a standard white, clinical looking approach, we looked at current colour trends with dark greys and black very popular within the home, giving a modern and prestigious look and feel – a message that sits well with the products on offer. Bold, bright imagery was also a main feature to draw attention to the products with not too much text, but enough to give the reader information about the products”, says Mark. The range of new marketing materials and the growth of the marketing and customer support team is having a real positive effect with Selecta’s customer base as fabricators look to grow their business further.